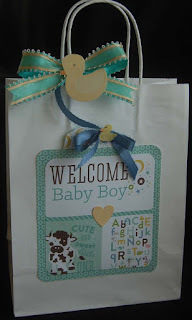 I felt like creating another baby gift bag and thought I'd make it a little fancier but usable for either a girl or boy. 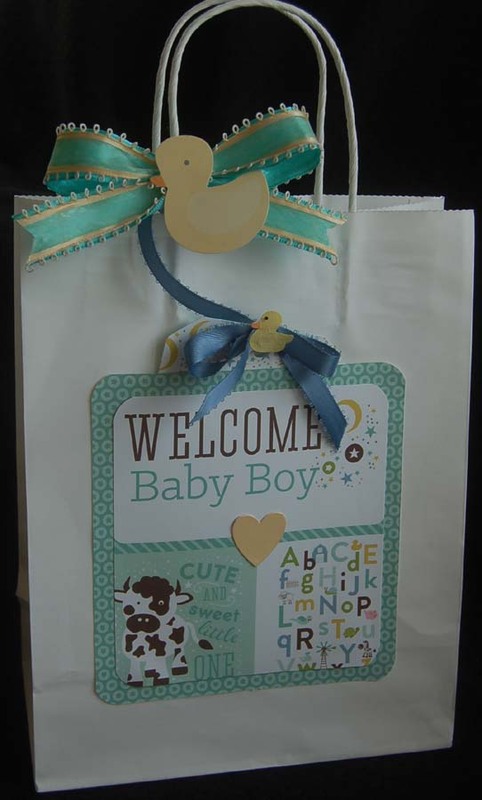 Like the previous gift bag I made a pocket from two printed card stock sheets (Simple Stories "Hello Baby' and Echo Park 'Bundle of Joy'). As in the last post, I cut the tag out from the back sheet of the pocket since the cut out wouldn't show. Lacey edging was punched out from white card stock using a Martha Stewart punch and used to decorate around the pocket, bag edge, and tag bottom. 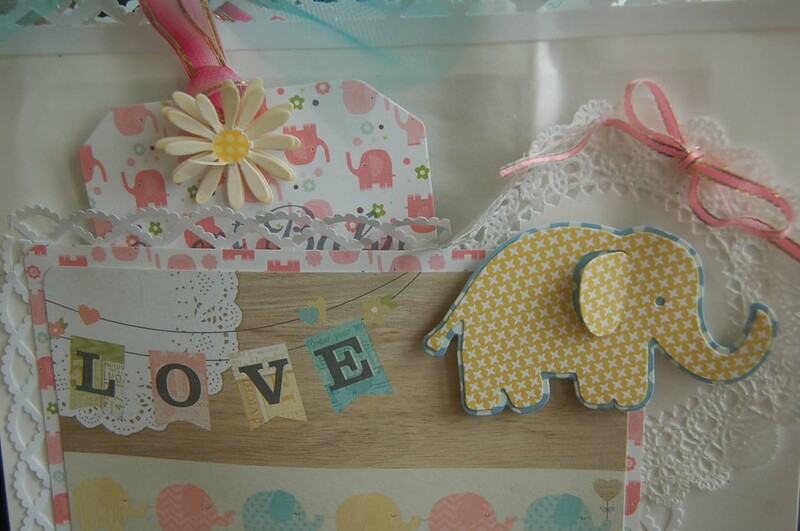 To accent the sweet little die cut elephant (made with a Sizzix die set)....notice the flapping ear, I placed him on a lacy doily. I just love him! The elephant print tag has another die cut elephant that came from a Sizzix set that contains clear stamps too....adorable. 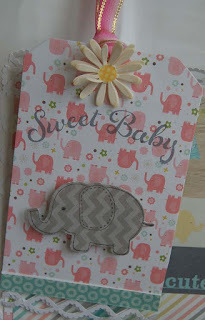 The 'Sweet Baby' sentiment is from a wonderful Echo Park stamp set. For the pocket on the back of the tag I used a word panel from the EP paper pad and decorated it with a Echo Park bib die cut that was stamped with 'Little One' from another EP stamp/die set. Finally, I added ribbons, K and Co. daisy stickers and tulle (glued around the handles and for bows). HM Ben Franklin Crafts has so many marvelous baby themed products I know you'll be impressed and tempted to purchase them even if you currently have no reason to give baby gifts. You never know; life is full of wonderful surprises! I spied so many really cute baby paper crafting supplies at HM Ben Franklin Crafts that I couldn't resist buying some even though we don't have any new babies in our family...hahaha! 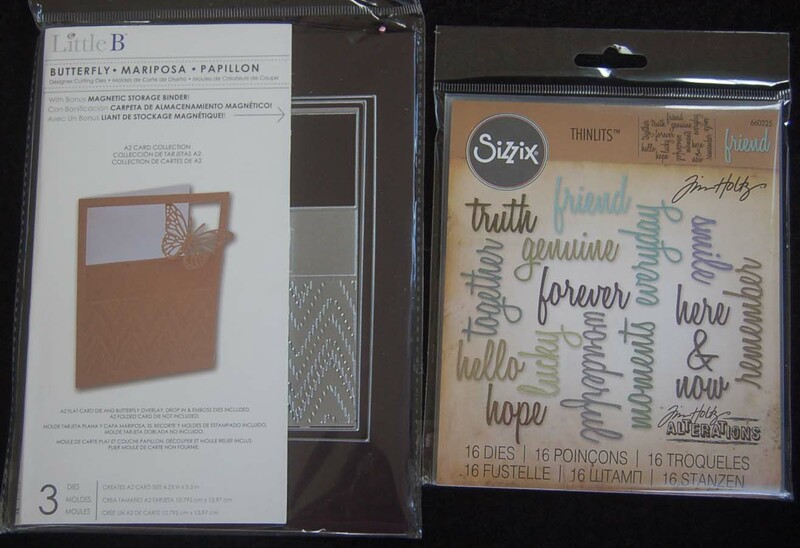 I also saw some packs of undecorated gift bags in white, natural, and multi-colored sets. 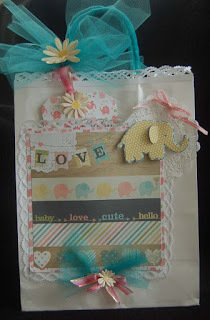 I decided that a gift bag would be a perfect format for decorating and including a tuck-in card/tag. 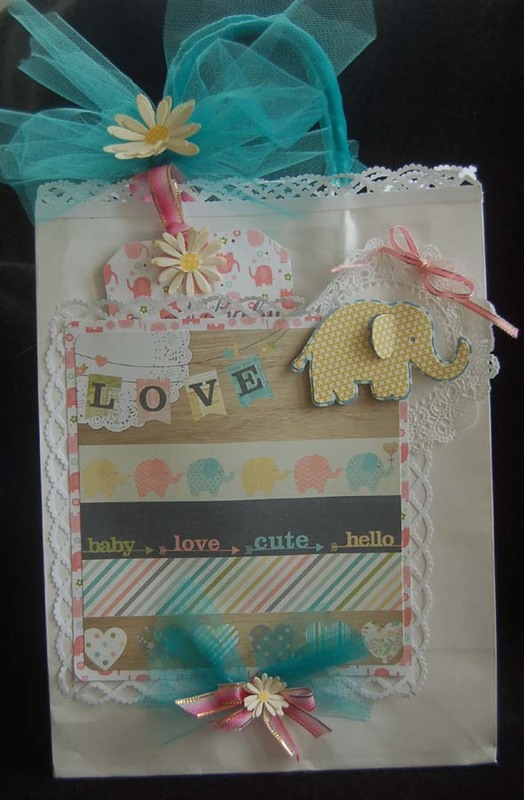 The pocket in the front of the bag is simply two double-sided printed card stock papers (from the Echo Park 'Bundle of Joy' 6x6 paper pad) layered with corners rounded. 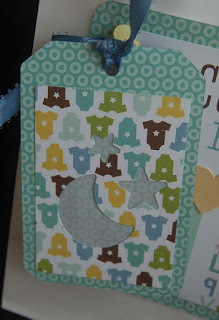 To make the tag that inserts into the pocket, I used a Little B tag die from the tag set. The tag was cut in the center of the paper in back of the layered pocket....the top piece hides the cut out so you maximize the usage of the 6x6 paper. I used the moon and stars dies (Echo Park) to cut windows in another paper and lined it with frosted vellum paper so that a gift card/ message inserted in the tag pocket will be seen. 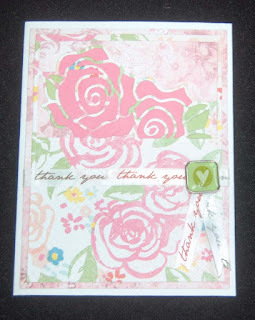 For the other side of the tag I used dies from another Echo Park die set. Ribbons and duck stickers (Sandy Lion and Pebbles) added the final embellishment touches. 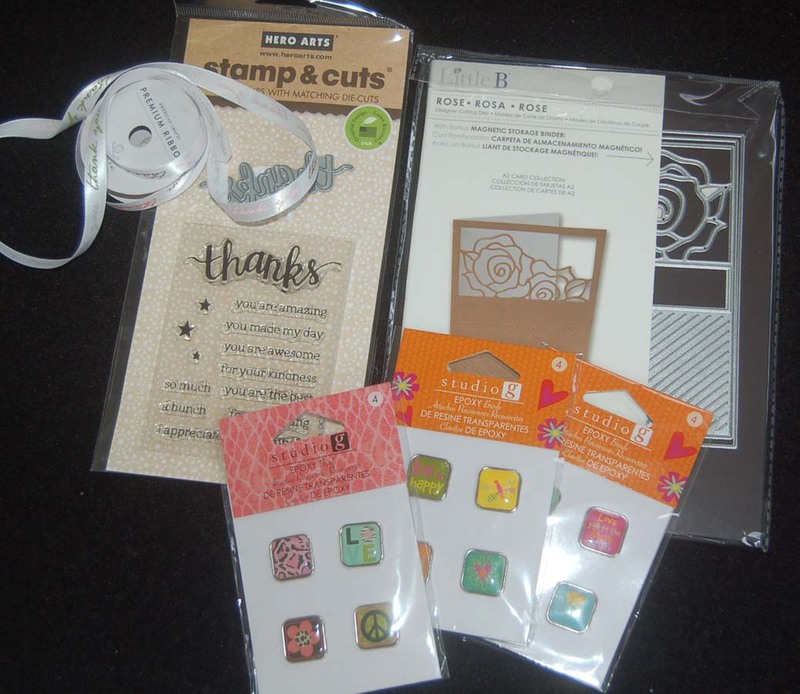 I enjoyed making this gift bag with gift card /tag because of all the cute Echo Park products I purchased a Ben Franklin Crafts. Coordinating the paper designs was a snap and made the finish product pleasing to my eyes. 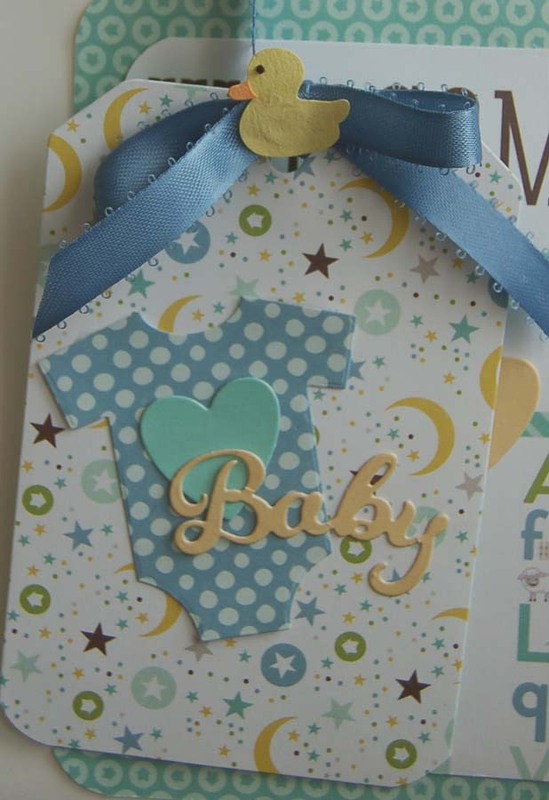 If you're in need of a baby gift wrap or even if you just like to prepare in advance, I hope you'll check out what BFC has to offer. I know you'll be please with their products. 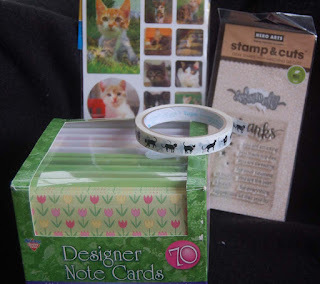 Happy shopping and crafting! When I made the card I showed on my last post, I thought it was the best use of the Little B die cutter, but after I made this card, I decided that I liked this one even better. It was a little more work than the first card, but I do love a shaker card...LOL! 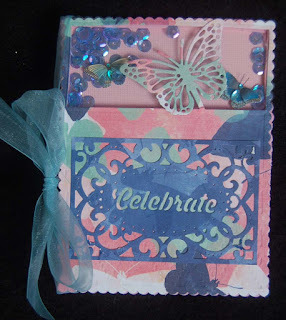 To make the cavity for the sequins and mini butterflies, I cut two layers of thin pink foam and glued them together. For a different border I used a favorite Mama Elephant scallop edge die. This great die also cut the card glued to the back of the shaker panel. Just put the scallop die near the left-side fold so that the edge stays intact. 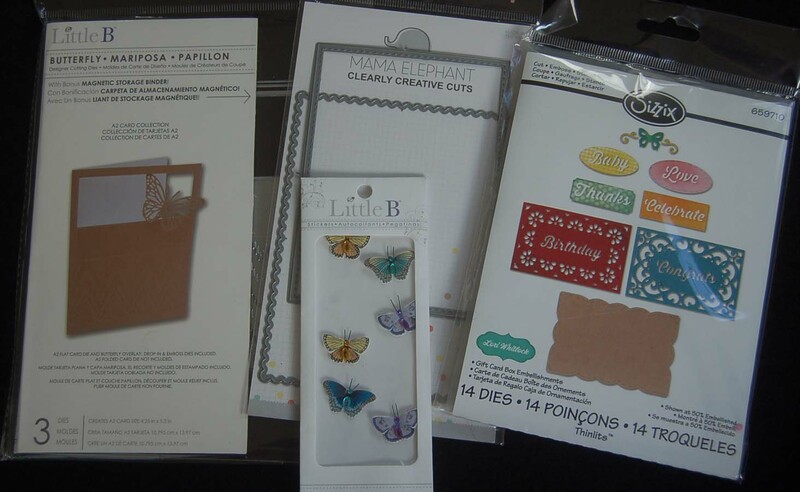 The Sizzix label dies are another fabulous, useful set... (14 pieces! 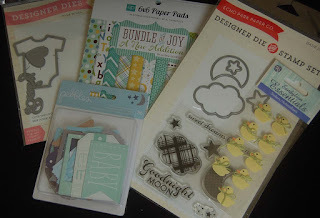 )lots of terrific word dies and pretty labels not shown on the package front. Oh yes, the Little B butterfly stickers were dusted with corn starch (so they wouldn't stick) before placing them in the shaker window. I almost forgot, the double sided butterfly print card stock is a Bo Bunny product...so nice to have both sides coordinating. Okay, that's it for this post. Hope you're having a great crafting month! Enjoy! I truly love the way this card turned out. 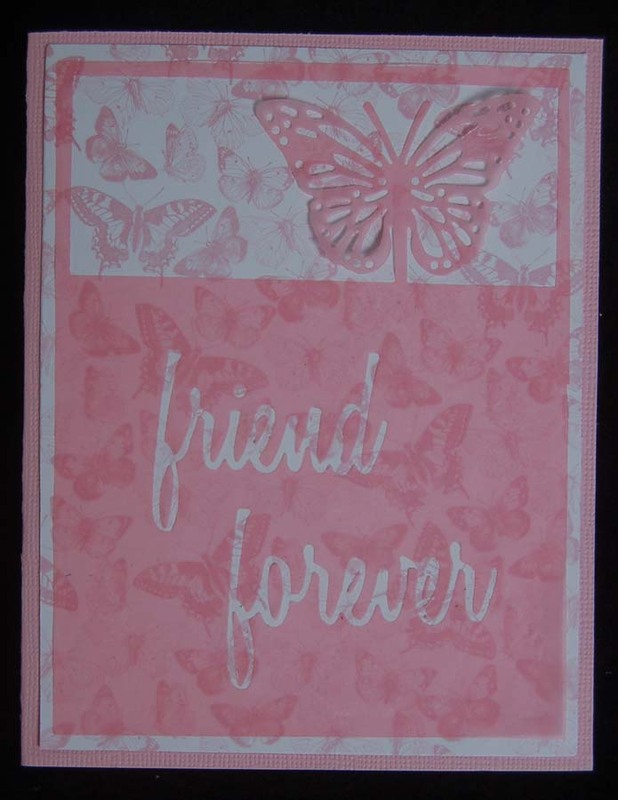 The soft pink shades and the sentiment, make it suitable for many occasions. This one goes into my emergency card stash. Thanks for stopping by. Please leave a comment if you have some free time. I love hearing from you! 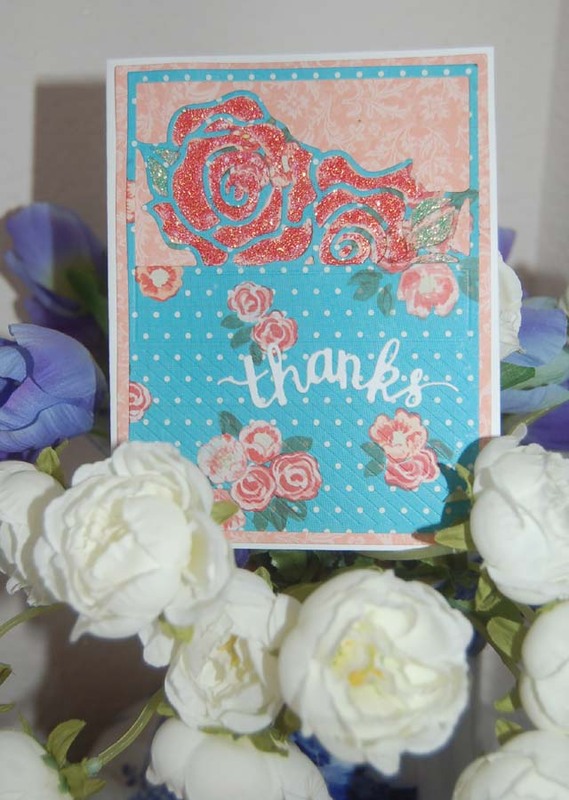 Although my mother has been MIA (majonging in afterlife) for many years, as soon as I saw the Little B rose cutting die, I knew it would make a beautiful Mother's Day card (so I had to show it to you). 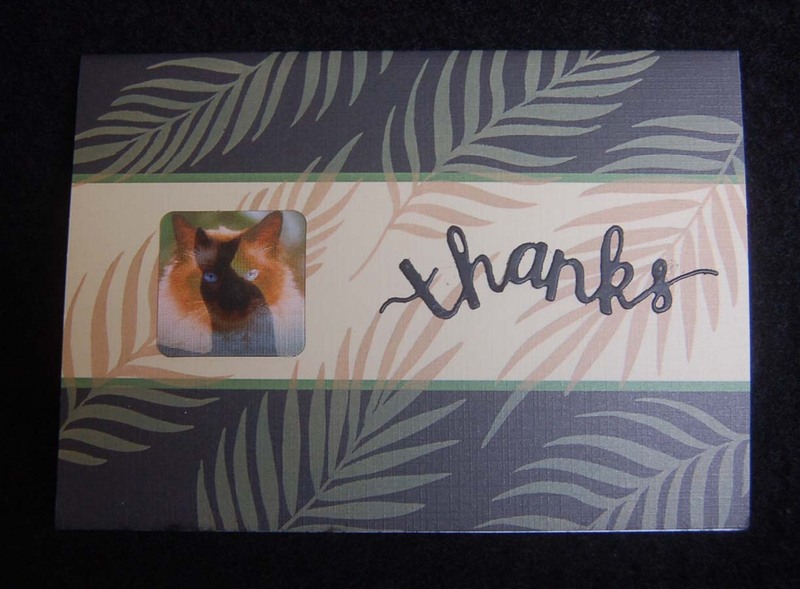 Since I didn't need a MD card, I decided to make thank you cards (something that I mail out often) instead. 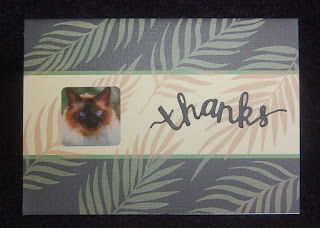 It was really simple to use the die on printed and solid card stock. 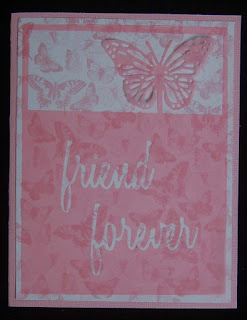 Here's another version using the same Little B die from HM Ben Franklin Crafts. 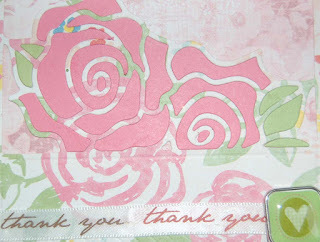 Instead of gluing the pieces back into the roses, I filled in the spaces with Stickles glitter glue. 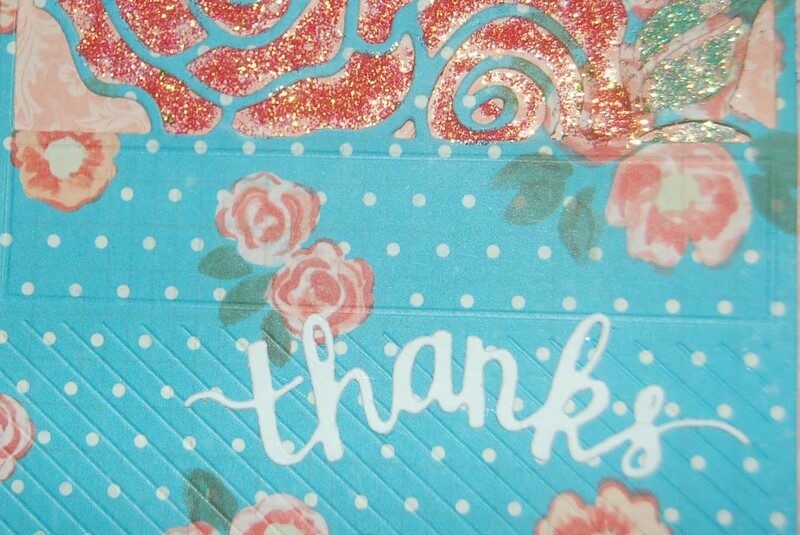 This is a close-up of the Hero Arts die cut 'thanks' which also shows the embossed detail that the LB die impresses while it cuts. These two dies are among my favorites because of the diversity of their uses. 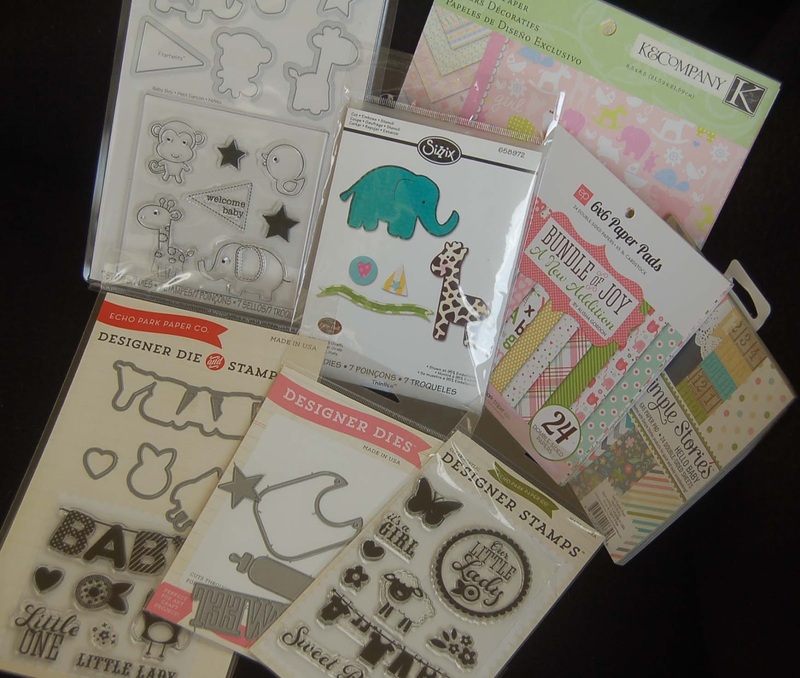 I hope that you will shop at HM Ben Franklin Crafts soon and purchase some of their fabulous crafting supplies. 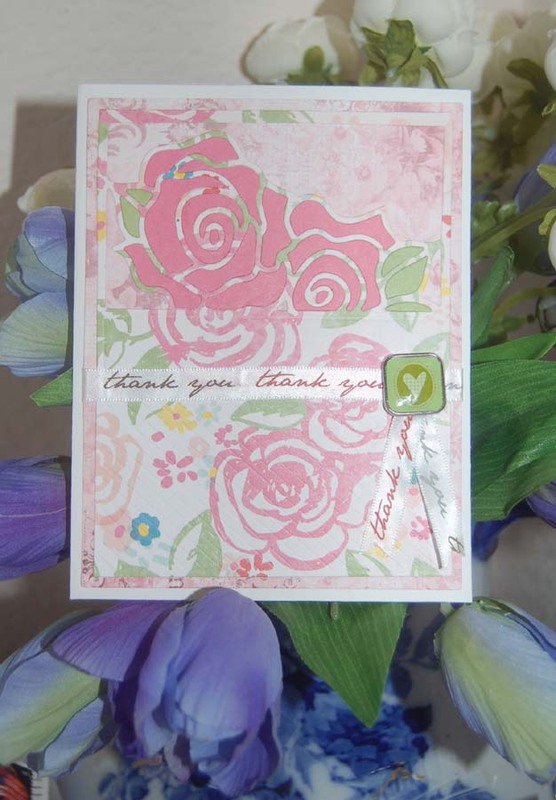 Just think of all the beautiful cards you can create for your mom and anyone you appreciate. Happy Crafting! 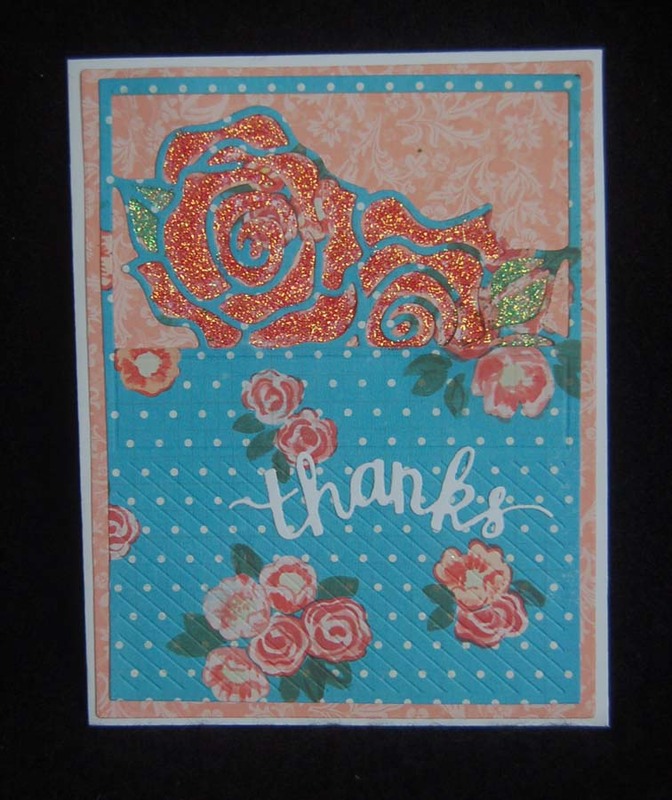 I wasn't planning to post this thank you card because it was too embarrassingly simple, but I really liked how it came out, so here it is. It all started with a set of flicker cat stickers purchased at a discount store. I don't own a cat but know lots of people who do so I knew I'd make use of the stickers....eventually. Remember the flicker pictures we all were fascinated with as kids? They change as you move the image back and forth. Here's how the cats merge with a flick of the wrist. 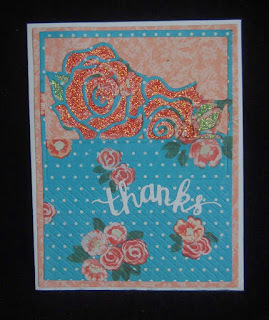 I simply stuck the sticker down on the pre-made card (from a Nicole Designer Card set purchased at HM Ben Franklin Crafts and added the die cut 'thanks'(Hero Arts stamps and die set also from BFC). Voila! It's an instant thank you note for a cat lover. 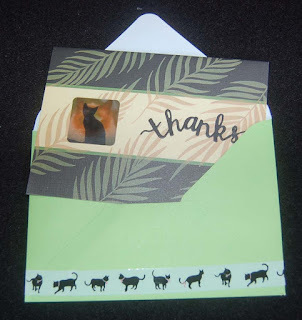 I love decorating envelopes too, and chose a decorative cat tape (not washi) I found at Celebrations (next door to the Mapunapuna BFC) to border the front and back of the envelope. 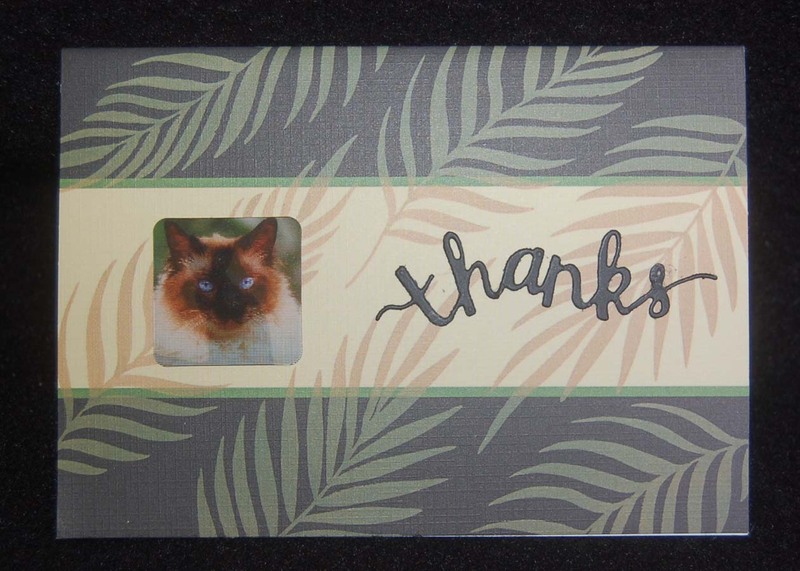 Well, that's it for this 10 minute thank you card! 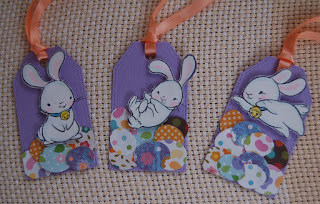 While cleaning up my Easter supplies, I found three cute Sister Stamps bunny images. (I think there are four bunnies, one possibly for the year of the rabbit.) Since I already had them stamped and colored, all I had to do was cut them out and die cut some eggs using the Lawn Fawn dies (shown in my last post). 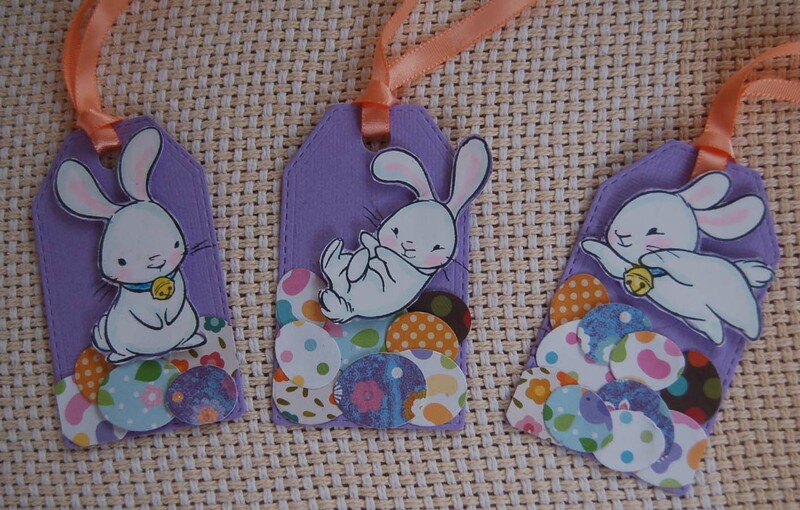 I still had lots of small printed scraps for the eggs so I couldn't resist whipping up a bunch of tags. 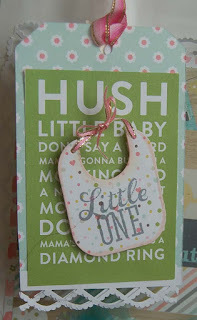 The Paper Smooches tag die is one of my favorites because it has the stitched edges. After trying many brands of sticky dots, I've discovered that I like the Scrapbook Adhesive 3D Foam Squares best. 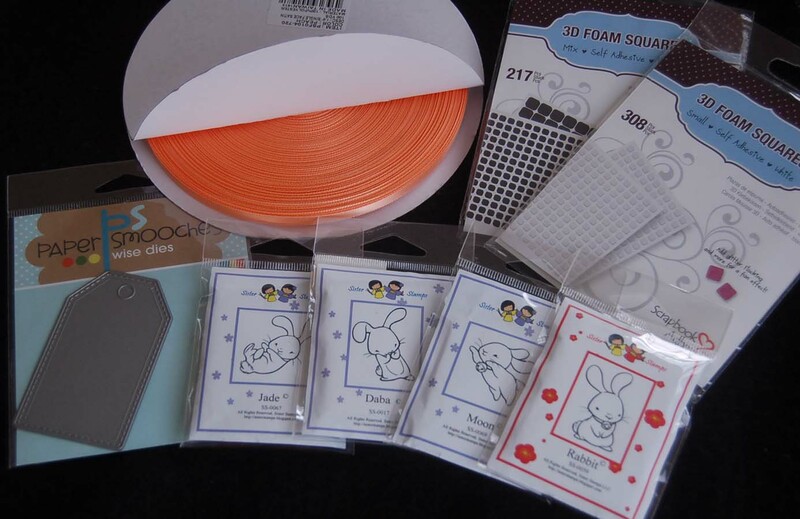 There are lots of round-corner squares in a package and they are just the right thickness to raise up the images without making the card too puffy. I buy all of my adhesive products from HM Ben Franklin Crafts....they have a great supply! Also from BFC is the giant 100yd. 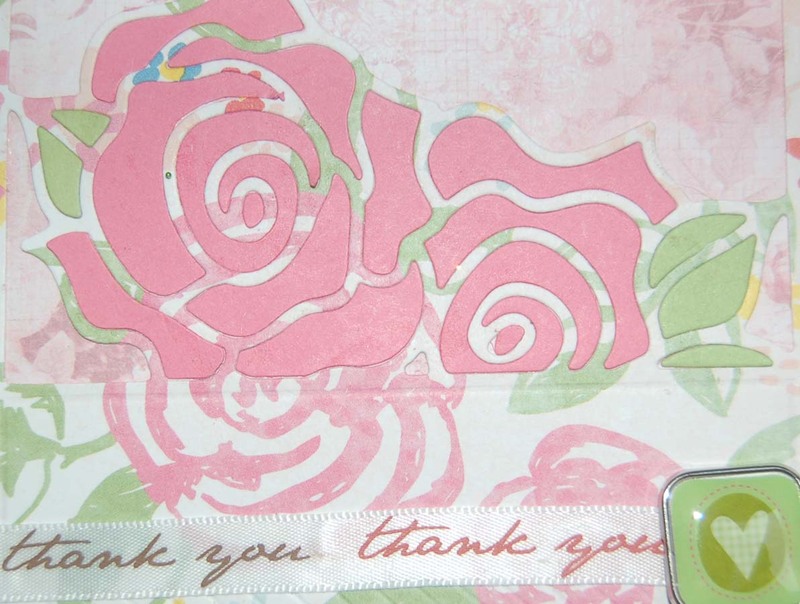 roll of salmon colored satin ribbon.....it was in a clearance bin for only $2.50! Always be sure to check out the clearance area of BFC because you never know what bargains will be there....guaranteed to make you smile!